You are about 30 minutes from destination when the Captain announces, "Folks, we will be holding for the next 40 minutes because of a thunderstorm over the field. I will get back to you if there are any changes. Thank you." There are a few of reasons why your flight has to hold, but it comes down to one thing usually - too much traffic for the airport. Most of the time it is weather-related, either a thunderstorm near or over the airport and maybe reported windshear. Maybe visibility has dropped so that arriving aircraft must fly a full instrument approach, or winds make more separation a must between aircraft. Weather might also be a factor in shutting down or restricting arrival rates into a particular runway that is normally in use. The volume of aircraft might be too much or there could be an emergency in progress at the field. Whatever the reason, the ATC (Air Traffic Control) needs that flexibility to maintain safety margins among all the arriving and departing aircraft. Holding is an enroute tool that can be used to gain such margins. Usually ATC gives you time to be ready to set up for holding. Also, the pilots are on radio frequency and listening to aircraft ahead get holding instructions, so that gives your pilots a heads up as to what might happen to your flight. Most of the time your aircraft is flying an arrival route (called a STAR (Standard Terminal Arrival Route) explained later in another section!) that has holding patterns already drawn and depicted on a chart. ATC will then issue holding instructions on one of those fixes on your arrival route. On most aircraft, those holding patterns oriented to those fixes, are in the computer database on board. It is then a relatively easy and quick means to bring those up and double check that the particulars are right. A more complicated and time-intensive effort is required when either ATC issues holding on a fix that a pattern is not depicted or you are on an older aircraft that does not have a database. A holding pattern is an oval racetrack with straight segments. The length of these straight segments can either be based on time or distance. 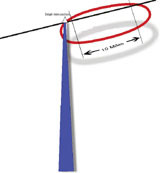 Below 14,000 feet, the time for one straight segment is one minute. Above 14,000 feet, one and 1/2 minutes. However most of the time, your pilots will request a pattern based on distance- 10, 15, or 20 miles as that minimizes the amount of turns and thus can save fuel (an aircraft in a turn loses lift so engines must add more thrust to keep altitude which burns more fuel!). Each holding pattern has a fix, a direction from the fix, direction of turn, right (standard holding pattern) or left, (nonstandard holding pattern)) and a line of position from that fix or a VOR (VHF Omni-directional Range) radial that can define that fix. Finally, there is always a speed associated with holding. First, ATC expects your aircraft to start slowing to the designated holding speed three minutes prior to arriving at the fix. There are maximum air speeds for the pattern set by the FAA to minimize airspace requirements for that particular holding pattern. However, most pilots will come nowhere near these maximum speeds but rather fly the minimum airspeed so that they can minimize fuel burn. These speeds can either be computed manually or automatically by the computer. Speeds are based on your aircraft weight, altitude, and even temperature. An example of an ATC holding instruction can be something like this: "Mountain Air 77, cleared to hold at Steph intersection as published, 10 mile legs approved, EFC (Expected Further Clearance) is 1400, time now is 1330. Maintain flight level 220." Your pilots will then read back these instructions. EFC is the time your pilots can expect to receive clearance beyond a clearance limit, in this case- Steph intersection. In the event of two-way radio communication failure, the EFC also allows your pilots to depart the holding fix at this time. This is also a good indication to of how long ATC is holding aircraft. As you might expect, this is a very busy time for ATC and your pilots. If there are multiple aircraft arriving over the same route, then many times ATC will stack them up at 1,000 foot vertical separation intervals over the same fix. You might look out your window and see these aircraft all flying the same racetrack pattern! The main concern of your pilots is the fuel remaining, fuel required to get to your destination, and if needed- fuel to an alternate. Usually the Captain will do all of the coordination and figuring out the "bingo" fuel, slang for the fuel required to either get to your destination or to your selected alternate. He will then go over this calculation with the First Officer who is actually flying the holding pattern and talking on the radio to ATC. The Captain will then many times, talk or type in the computer via a data link to the respective company flight dispatcher handling your flight on maybe a possible change in alternates if weather has changed, a closer alternate to reduce the "bingo" fuel required, and any other support required. Many airline operations have a designated ATC desk that is a liaison with ATC that might be able to give a little better picture on how long holding/delays can be expected. Finally, the Captain will talk to the passengers and inform them of what is going on and what the expected delay can be.